Hal Landvoigt doesn’t care what flavors you can identify in a Walla Walla merlot. He just wants you to enjoy it. “I don’t really care what wine you want to put with food or how you want to drink it. I just want you to drink wine,” says Landvoigt, director of winemaking at Seattle’s Precept Wine. That’s why he focused not on the flavors but on the overall experience when he started experimenting with a special blend designed to retain its flavor at cruising altitude on airplanes. Taste buds are dulled at 35,000 feet, turning everything you eat into a shadow of itself – similar to the sensation of eating with a cold, say researchers at the flight test facility of Germany’s Fraunhofer Institute for Building Physics. So when the opportunity arose to develop something special for Alaska Airlines’ onboard menus, Landvoigt jumped at the chance. “I thought ‘These people are maybe crazy enough to let me be really crazy,’” he says with a laugh. The project began with a challenge from Alaska CEO Brad Tilden – to find great, local wines to serve by the glass to Alaska’s main cabin customers, says Lisa Luchau, Alaska’s director of onboard food and beverage services. Landvoigt began by bringing small samples of wine (under 3 ounces) with him when he traveled, to taste on the ground and in the air and test the phenomenon himself. Then he went back to his lab, tucked in a corner of Precept’s fourth-floor offices in Seattle’s Eastlake neighborhood. Bottles of wine crowd the counter and tabletop, fighting for space with beakers, vials, a magnetic stirrer and other lab equipment. He begins with a control, say a merlot from Walla Walla. One by one, he adds the tiniest increments of sugar, tannins, gum Arabic. Looking from the control to his final product, Landvoigt shakes his head. “Knowing what I do now, why would I give someone something that tastes like this, when I can give them something that tastes like this,” he says, gesturing to the wine in his hand. For Alaska, Landvoigt ended up with a pinot gris and merlot with just a smidge of extra sugar. 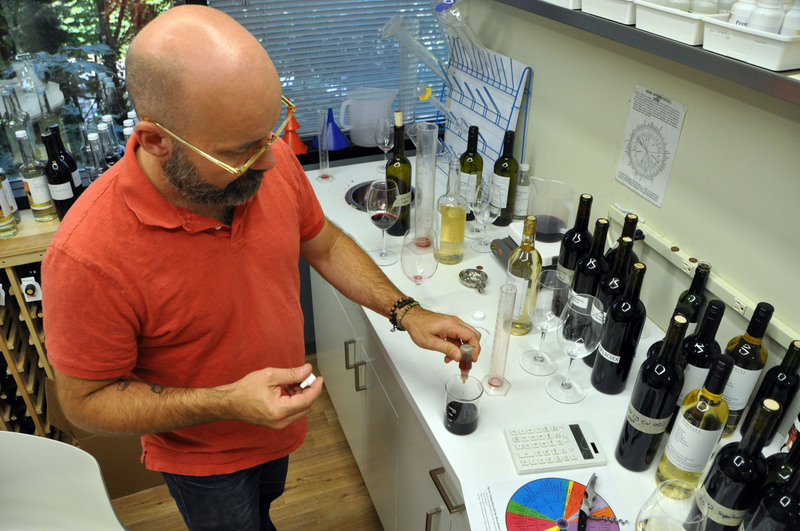 “There’s a way to balance wine so all the flavors work together. In the air, we make wine a little sweeter because it tends to taste more acidic,” says Landvoigt. The onboard wines – Canoe Ridge’s Exploration merlot and pinot gris – mirror the winery’s on-the-ground Expedition merlot and pinot gris, and have been flying on Alaska and Horizon Air flights since February. In fact, Landvoigt’s wines fly so well that customers are buying 25 percent more wine onboard than they were in 2013, and wine has become the complimentary beverage of choice for Mileage Plan MVP Golds. But if you want to taste Canoe Ridge Exploration, you won’t find it at the grocery store – you’ll have to take flight. What’s your favorite varietal to enjoy while traveling? Learn more: the science of airplane food.